SUPREME QUALITY 16's Blended HOTEL WASH CLOTHS, 12x12", 1.00 lbs/Dz, White, Overlocked Edge, Price each, Sold by the Dozen. HSD SOFTSPUN Wash Cloth, (hemmed) White 12x12", 1.00 lbs/dz. Blend, Case of 1200. Price each, Sold by the Dozen. Hotel Oxford Gold, RingSpun Wash Cloth, (Overlocked) White 12x12", 1.00 lbs/dz. 86% Cotton/14% Cam, Case of 300, Price each. Economy 16's Premium Blended HOTEL WASH CLOTHS, 13x13", 1.50 lbs/Dz Wt, White, Price each, Sold by the Dozen. 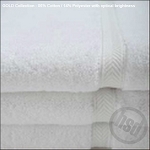 HSD SOFTSPUN Hand Towel White 15x25", 2.25 lbs/dz. Blend Cam border, Case of 240. Price each, Sold by the Dozen. 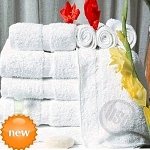 Economy 16's Premium Blended,16x27" HOTEL HAND TOWELS, 2.75 lbs/Dz. Wt, White, Price each, Sold by the Dozen. 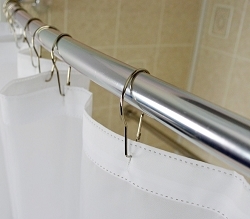 PIN STYLE METAL CURTAIN HOOKS, FITS 1 1/2" SIZE RODS. Please order/buy a minimum of 12 and in additional increments of 12 due to our manufacturer packaging.